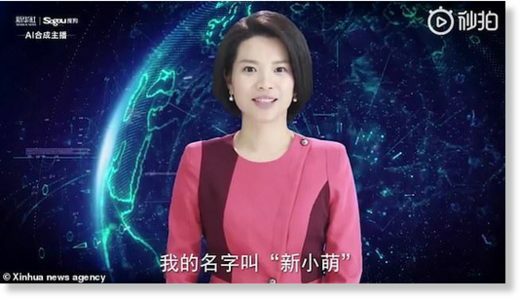 China’s state-run press agency has welcomed its first female AI anchor who will join its growing team of virtual presenters. 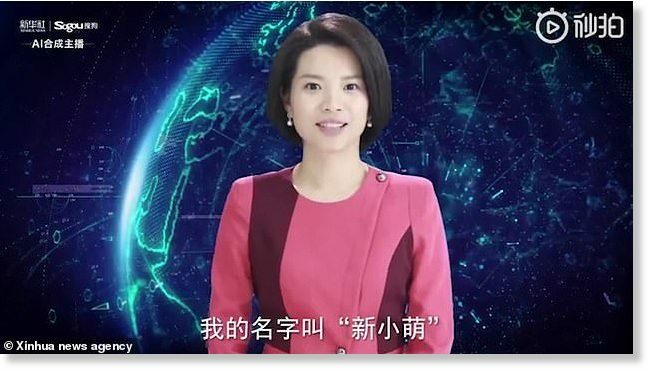 The female AI newsreader will make her professional debut during the upcoming meetings of the country’s national legislature and top political advisory body in March, according to Xinhua at a press conference on Tuesday. Modelled after the agency’s flesh-and-blood journalist Qu Meng, the AI newsreader was jointly developed by Xinhua and search engine company Sogou.com and can ‘read texts as naturally as a professional anchor’. ‘Hello everyone, I am the world’s first female AI presenter developed by Xinhua News Agency and Sougu. My name is Xin Xiaomeng,’ says the journalist in an introductory video. She joins the digital doppelgangers of English-language anchor Zhang Zhao and his Chinese-language counterpart Qiu Hao, who were unveiled in November during the 2018 World Internet Conference in Wuzhen, Zhejiang province. Xinhua also on Tuesday unveiled an improved version of its AI presenter Qiu Hao, named Xin Xiaohao, who is able to gesticulate in a natural manner and read the news while standing up. An AI system has been used to synthesise the presenters’ voices, lip movements and expressions based on those of real presenters. The digital anchors offer certain advantages over humans, Xinhua previously said. They are available to work 24 hours a day on its official website and various social media platforms. This can reduce news production costs and improve efficiency during breaking news reports. Xinhua said that its ‘new employees’ have taken to their roles with enthusiasm and have published more than 3,400 reports totaling over 10,000 minutes in length since November. Net users previously welcomed the new presenters while others questioned whether they would replace their human counterparts. Some complained that the AI newsreaders had a very robotic and unnatural voice. China has become one of the leading global hubs for AI development in recent years. Several fields such as finance, healthcare, and manufacturing have adopted machine learning systems for commercial uses. ” Xinhua said that its ‘new employees’ have taken to their roles with enthusiasm “. They are digital images. talking head cartoons. They can’t express “enthusiasm” and have no emotion or freedom of choice. Come to think of it, this is probably what we’ll all be like a few years from now. Automatons. take heed.